Cricket Swanson is one of Pepperwood’s newest Stewards and has been a tremendous volunteer over the past couple years! She is also this year’s SRJC Pepperwood Barnhart Herbarium Intern and is conducting a research project at Pepperwood. Responses below by Cricket. Please introduce yourself and tell us a bit about your background. What made you decide to study biology? My name is Cricket Swanson and I am a student at Santa Rosa Junior College. I am majoring in Biology and getting ready to transfer to UC DAVIS to continue my studies in Ecological Management and Restoration. I have always had a deep appreciation and concern for the natural world. I spent my youth hiking the trails of Southern California and was inspired to enhance my admiration of nature through education. 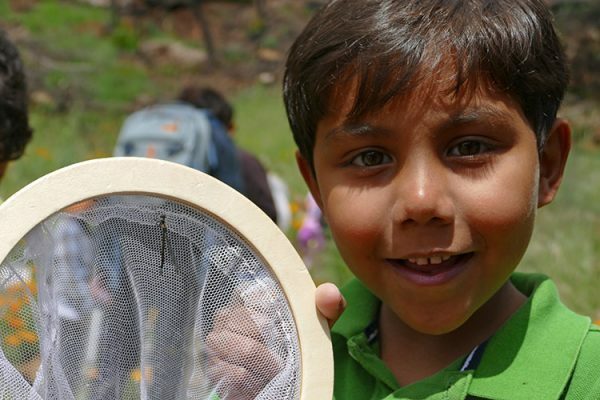 I am in awe of the story that can be revealed when the interactions of organisms and their environments are explored. 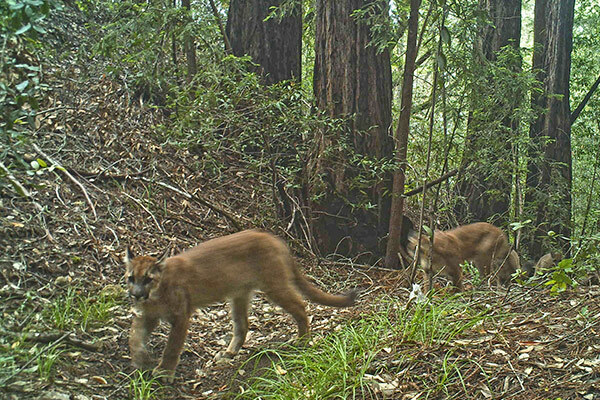 I strive to deepen my understanding of ecosystems so that I may do my part to protect and repair ecological services. What attracted you to Pepperwood? How did you first get involved? I became familiar with Pepperwood through courses at SRJC. I was thrilled to take the Bio 85 series at Pepperwood in the Spring of 2013 and became a certified UC Naturalist in Fall of 2013. The experience of learning in the field gave me the inspiration I needed to enhance my full time studies. I became a Pepperwood Steward in Spring of 2015 and shortly thereafter an intern. 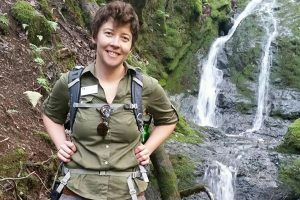 I have participated in a range of volunteer activities including: weed warriors, herbarium collection, phenology, public and member hikes, wildflower walks, events, classes, Discover Nature lectures, and now a self-led project through my internship. What really drew me in was the opportunity to work with a large piece of protected land, and with the mutual support of friendly and knowledgeable people. Please tell us about your internship and the project you are working on. 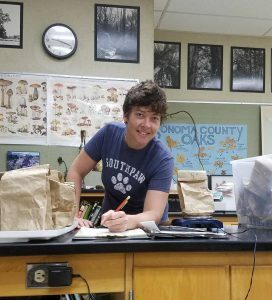 To earn the award of the Steven J. Barnhart Herbarium Internship at Pepperwood I wrote a project proposal to gain skills in the field of restoration ecology. 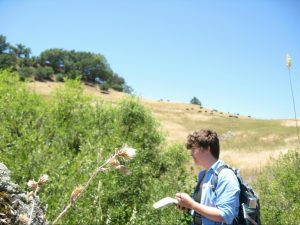 Having been given the honor of this internship, I knew I wanted an aspect of it to be on-site, thus giving me an opportunity to explore the preserve and gain field experience. I chose to split the focus of my project between greenhouse research with Salix lasiolepis (Arroyo Willow) propagation, and riparian restoration site identification and recommendations. The willow research involves testing the effects of using a pruning sealer on cuttings taken from the preserve and grown in a greenhouse. 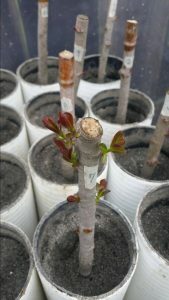 The sealer may increase the success of the cuttings by slowing water loss. I am currently analyzing data and will have conclusive results to report soon. In my field work, I walked the creeks of the preserve and made recommendations for gully repairs. Based on these recommendations, I organized the construction of a series of brush check-dams near the top of Roger’s Creek with a group of volunteers. What is your project accomplishing? What impacts do you hope it will have on the land? In riparian restoration, willows are used to increase woody vegetation and stabilize the soil through their large root mass. As the climate continues to change, efficient techniques in different conditions are needed to increase restoration success. It has been suggested by the Aberdeen Plant Materials Center that a pruning sealer may slow transpiration and increase establishment success of woody plants such as willow and cottonwood. The goal of this research is to test this suggestion in a controlled environment to better understand the advantages of using the sealer. As for the restoration work done onsite, the primary goal is to reduce erosion through gully repair and headcut stabilization via armoring and the construction of brush check-dams. Reduction of erosion will decrease loss of soil and lessen sediment load downstream. What have you gained through your internship experience at Pepperwood? 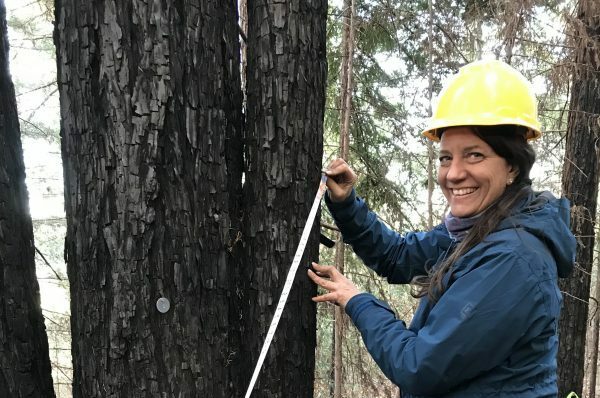 The field component along with a controlled experiment have allowed me to explore and develop a range of skills including experimental design and analysis, field data collection, and project management. I have gained experience and confidence through this endeavor and have further developed my community of like minded peers and knowledgeable advisors. These relationships are vital to me as I continue in my personal and academic journey toward a career in ecological management and restoration.